One journalism start-up tries to restore things to the way they were. The other is looking to a different future. Bill Grueskin, academic dean at Columbia University’s Journalism School and a former managing editor of WSJ.Com, compares them in this guest post. You can learn a lot about where journalism is headed by looking under the hoods of two new startups. The companies – Journalism Online and Publish2 – share a common goal, to help save journalism. But they couldn’t be more different in they ways they’re organized, the backgrounds of the executives or the solutions they offer. Journalism Online is a weeks-old venture founded by Steven Brill (founder of American Lawyer), Leo Hindery (former telecom chieftain who was the partner of Newsosaur Alan Mutter back in their cable-TV days) and Gordon Crovitz (ex-publisher of The Wall Street Journal, where he was my boss when I was managing editor of WSJ.Com.) Their group vows to provide streamlined ways for publishers to generate online circulation revenue. In the other corner is Publish2, run by two young guys you may never have heard of, Scott Karp and Josh Korr. Karp ran digital strategy at The Atlantic, and Korr helped develop a Web site for the St. Petersburg Times, but their combined experience is a pittance compared to what the Brill/Crovitz/Hindery team can muster. Still, their company has raised $2.75 million in Series A venture funding and $1 million in venture debt. The two likely don’t see each other as competitors; indeed, they’re rarely cited in the same article or blog post. But I happened to interview Crovitz and Karp separately one day last week, and was struck by their widely different visions of journalism’s future. Crovitz is a thoughtful (as in Rhodes Scholar-thoughtful) gentleman who oversaw much of the growth of the Online Journal. In our interview, he outlined a four-pronged strategy, ranging from providing a commerce system for publishers to devising aggressive marketing plans to sell subscriptions across the board for multiple outlets. His group also wants to help negotiate licensing and royalty deals with aggregators, which may explain why they brought attorneys David Boies and Theodore Olson to the company’s board. Crovitz believes a coordinated effort to build subscriptions could bring scale and lower costs. In the late 1990s, when a one-year WSJ.com subscription cost $49, the incremental cost to serve a new subscriber was $8, Crovitz said. By 2006, the price of that subscription was $99 while the cost of serving the subscriber had dropped to 85 cents. Which gets us to Publish2. Karp wants news organizations to get back to the distribution business by sharing their own content broadly and surfacing others’ content aggressively. That goes against the instincts of many journalists, but even when reporters buy into it, the process in most newsrooms is clunky (lots of cutting and pasting, with links often stuck under the ads). So Karp offers a platform to make that process as seamless as possible. To see this in action, Karp cites coverage of floods last January in Washington State. As high waters inundated highways and breached levees, editors who ordinarily would compete with each other used Publish2 to learn what other news organizations were reporting and to sharing that content as part of their overall reports. A fuller explanation of that effort appears here, and an example of how this looked on one of the sites appears here. Karp is rolling out an ambitious project to track spending in the federal stimulus plan, marrying reporters’ content and citizens’ tips, but – and this is important – always through the lenses of journalists. He calls this as a “new ecosystem” of news, that is, a way of understanding that the Web empowers sharing of information, and that journalists have a special role to play in identifying worthy content and evaluating the quality and credibility of others’ reporting. So, which vision will succeed? As Crovitz demonstrated at Dow Jones, a subscription strategy can generate substantial revenue and define a uniquely valuable audience. Too often, this strategy is portrayed not as a business case, but as a moral argument, viz., good journalism costs a lot of money, and so readers ought to pay for it. That entails its own risks. Or as Jonathan Landman, deputy managing editor of the New York Times, told alumni of Columbia’s journalism school Saturday, "Imposing a pay wall could be risky without being bold." Karp’s business model is also uncertain. He foresees paid, commercial applications of his platform, as well as building a broader advertising network among news organizations. But what Publish2 also represents is a vision of how journalists can take advantage of each other’s strengths and readers’ knowledge, creating content that transcends what any one newsroom can do. Right before Karp came to my office last week, he visited the New York Times’ newsroom and made a quick convert in Michael Moss, an investigative reporter. Moss has been writing about food safety, and he asked Karp for ways to maximize reader attention to his investigative work. Karp turned the tables and “suggested reframing the issue by thinking of ways to generate interest before the stories run,” Moss said. So Moss put out a direct appeal to readers for tips. So there you have it: One new firm seeks to generate much-needed revenue by building a platform for subscription services, another seeks to generate new forms of journalism with a platform to share and distribute content. It’s hard to reconcile those two visions of journalism’s future. Here’s an addendum to the points by Crovitz and Karp on news organizations losing their preeminence in the distribution channel. According to Sharon Waxman, Google CEO Eric Schmidt is saying his company will launch an algorithmically based filtering system in six months to surface news “the reader is looking for without knowing they’re looking for it.” That sounds like a turbocharged Google News, personalized without all the muss and fuss of setting it up. Both the New York Times and Washington Post will “get this treatment,” Waxman writes ominously, and “Google believes it will be able to sell premium ads against premium content.” Will the news organizations make more money? Not directly, said Schmidt, adding only they might get more traffic from Google, which they can monetize on their own. Instead of fretting about the all-time record dive in newspaper circulation the last six months, publishers should focus as never before on the quality, not the quantity, of their audience. That means, among other things, proving the passion and loyalty of their readers by raising the single-copy and home-delivery prices of their daily papers to at least the cost of a venti, double-shot, half-caf soy latte. They go for $3.90 apiece at the local Starbuck’s. Serious newspaper readers will be glad to pay the price, especially now that nearly all of them have gotten the message that the industry needs their support to continue producing the product they value. And advertisers of many premium products and services will gain new respect for a medium capable of attracting affluent, well-informed and passionate individuals willing to spare the price of a venti latte for a newspaper. As proof that premium circulation pricing works, look no further than The Economist, whose single copies sell for the cost of the approximately 1½ venti lattes. Named the top-performing magazine of the year for the last two years by AdWeek, the Economist in 2008 grew ad revenue by 25.5% last year to $131.5 million and boosted its circulation by 9.2% to 786,977. The Economist’s success in 2008 compares with the average drop of 7.09% in daily newspaper circulation and an average decline of 5.4% in Sunday sales in the six months ended on March 30 that was reported today by the Audit Bureau of Circulations, the industry-funded body. The record 7.09% decrease in daily circulation in the last six months rivals the 8.1% fall in daily circulation in the prior 12 months. The decline in circulation is long running, accelerating and seemingly irreversible. The last time daily newspaper circulation increased was in 1984, when it peaked at an average of 63.3 million papers per day. Using ABC numbers and historic data provided by the Newspaper Association of America, it is possible to estimate that daily newspaper circulation today has fallen to 43.8 million copies. Sunday sales now are 44.3 million vs. an all-time high of 62.6 million in 1990. The last time newspaper circulation was this low was in the mid-1940s, when the population of the United States was half the size that it is today. Today, only 18 out of every 100 adult Americans buys a newspaper. That is less than half the penetration the industry enjoyed in 1945. 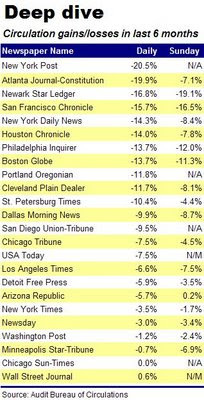 Not surprisingly, metro newspapers suffered the steepest declines in the latest circulation reports. Leading the carnage was the New York Post, whose daily sale plummeted a staggering 20.6%. As you can see from the table below (click to enlarge), the Post was followed closely by the Atlanta Journal-Constitution, Newark Star-Ledger, San Francisco Chronicle and several other double-digit losers. Many of the drops were self-inflicted, as publishers reined in their distribution areas to reduce the high costs of shipping comparatively small numbers of newspapers to distant counties. Significantly, the Wall Street Journal, which pursues a premium subscription and advertising strategy was the only one of the top 25 papers to show a circulation gain. Comparatively modest circulation declines were reported by New York Times, which sells in my neighborhood for $1.50 (plus tax) during the week and $5 (plus tax) on Sunday. After years of increasingly accelerating circulation declines, there can be no denying that print newspapers have become niche, not mass, products. This means publishers need to begin marketing them in a different way. 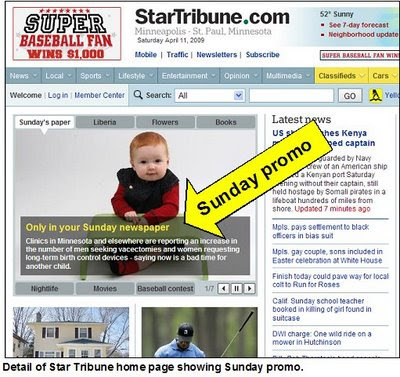 When the traditional newspaper model was to maximize reach by maximizing audience size, it made sense to keep subscription prices as low as possible to be able to charge advertisers the highest possible rate for the largest number of readers. “I sell bellybuttons,” said my friend Bob McCormick back in the 1980s. He was an ace ad salesman who at one point headed the agency that published the San Francisco newspapers. But mass quantities of bellybuttons don’t cut it for most advertisers in an age when they can connect rapidly and oh-so-cost-effectively with a prospect on the Internet by offering an ad that appears only when a customer Googles whatever magic words the advertiser has selected. Best of all, the advertiser pays only when a prospect clicks on a Google keyword ad; the rest of the dozens of times the ad appears, the advertiser doesn’t pay at all. Printed newspapers can’t compete with Google, of course, because they are unable to offer targeted, interactive advertising. But they can take a cue from successful magazines by targeting their customers geographically, demographically and in other ways. By charging premium prices to carefully targeted groups for single copies and subscriptions, newspapers will reinforce the value of the product to their customers and re-establish their value to advertisers. In so doing, the demoralized practitioners struggling with the challenges of the industry also may end up proving the value of the product to themselves. Beleaguered newspaper and magazine publishers may gain a certain amount of emotional satisfaction from mounting elaborate efforts to chase down online content poachers, but the payback may be more psychic than economic. :: There is no efficient way to identify and extract payment from the vast array of web publishers who may be ripping off content. :: There is a limited population of publishers generating enough money to make the effort worthwhile. Accordingly, there is a danger that the emerging initiatives among newspaper and other publishers to police content poachers may come to look more like an episode from the Keystone Kops than an effective and profitable business strategy. If everything were hunky-dory in the publishing business, this exercise in enforcing the value of copyright might worth a shot. It should be noted, however, that the music industry, which has been aggressively trying to battle pirates for 15 years, admits that 10 free songs are downloaded for every one that is purchased. But things are far from hunky or dory for publishers, as the latest dismal earnings reports attest. A content crackdown could prove to be a costly and unnecessary distraction at a time that publishers ought to be focusing on controlling the most important thing they can control: Monetizing the visitors and page views at their own sites, an objective that has become increasingly elusive for many of them. The above conclusions result in part from an effort to gauge the potential effectiveness of tracking down copyright violators by using a service called Attributor, which at the moment represents the industry standard in poacher-nabbing technology. As you can see from the results of the test-drive here, the state of the art at this writing suggests that a considerable amount of human judgment/capital would be necessary to actually DO something about unauthorized content poachers. I discovered that 99% of one of my posts had been grabbed and republished by a site called Newspapers Watch, which describes itself as written by “Musomar” a "journalist with 25 years of experience" in Malaysia. This particular site does not seem to carry advertising, so there would be no commercial reason to pursue the author. Even if the site did have ads, the sales would be so trivial – and the hassles of tracking down a copyright violator in Malaysia to complicated – that no one would bother to do so. This case was not an extreme example. In reviewing all the instances identified by Attributor, I found no violations by a site whose profile or advertising sales were so significant that I would dream of seeking payment. Based on this admittedly limited test, it appears that it would make sense only to go after only the relatively small number of sites what both use (a) lots of unauthorized content and (b) generate significant advertising revenues. How many of them are there? Honestly, I don’t know. But, judging from the sampling turned up by Attributor, probably fewer than you would think. Sites sophisticated enough to generate lots of traffic and advertising revenue generally will be smart enough to avoid copyright violations. They either will subscribe to syndication services or try to position excerpts from copyrighted articles – see this example from Huffington Post– as fair use. Fair use is the provision of the copyright law that allows snippets of protected content to be used in news stories and reviews. In other words, online publishers with something to lose either will pay print publishers or figure out ways to continue using copyrighted content for free. The ones who have little or nothing to lose may well continue to use copyrighted material brazenly. Does it make sense for publishers to hire David Boise and Theodore B. Olson to pursue them? If the time, trouble and cost of policing content are likely to net only limited amounts of new revenue for print publishers, don’t they have more important things to do? Peter Shankman, who describes himself as a marathon-running, sky-diving, cat-loving PR guy, says he is grossing nearly $1 million a year by using the web to help reporters find sources for stories. A reporter who needs to interview someone for a story sends Shankman a request, which he adds at no charge to a three-times-a-day email he sends to some 75,000 recipients who are looking for publicity. The recipients include individuals and fellow flacks. When a source spots a story where she thinks she can help, she contacts the writer and the connection is made. Shankman says 25,000 reporters have used his service and he reckons that nearly all of them have successfully sourced sources in the “12½ months” he has been in business. For those too rushed to wait for an email, Shankman also posts urgent requests at his perch on Twitter, which had 37,214 followers at this writing. The subjects requiring experts in one recent email ran from “spirituality during pregnancy” to families facing mortgage foreclosure to “whoopie pies,” which evidently are a Pennsylvania Dutch confection. Reporters seeking sources range from freelancers and aspiring book authors to name-brand news organizations like the Atlanta Journal-Constitution, Fox News, Ladies Home Journal, Christian Science Monitor, Motley Fool and the PBS Nightly Business Report. Shankman makes money by charging between $1,500 and $2,000 for a short, chatty text ad he runs at the top of each email. Recent sponsors have included a service that helps you contact celebrities, a company that sells computer-security software and the makers of the Dot Girl's First Period Kit. Shankman says the number of email subscribers and source requests has climbed by the week since he launched the service. The rollout has been entirely viral, with one HARO user telling another, telling another, telling another…and so forth. To keep up with the demand, Shankman said he has hired one editor and one assistant. That would seem to leave a tidy profit for Shankman to share with his sofa-hogging cats, Karma and NASA. Far from being outrageous, the sources who offer themselves up on HARO seem to be legitimate and useful to the journalists, said Shankman in an all-email interview. He admitted, however, that there have been a few “oops” moments. One case was a family featured in the Wall Street Journal whose business was “being killed” by the economy, said Shankman. “They’re now doing much, much better,” said Shankman. But even that’s “heartwarming,” he adds, ever the flack. Newspaper people are wasting time and wasting their breath in blaming Google for the failure of their products to thrive in the digital universe. They need to look to themselves – not Google, Yahoo or some other third-party savior – to begin strengthening their franchises and building up their businesses on the Internet. The airwaves have been clogged in the last couple of weeks with newspaper people alternatively blaming Google for the industry’s problems or begging Google to come to their aid. Google isn’t responsible for saving the newspaper industry or journalism. Publishers and editors are. As a rationally managed corporation, Google will do only the things that advance its best interests. The company isn’t going to start paying for newspaper content or sharing its revenues with publishers unless it is required to do so to grow its business, defend its franchise or comply with some as-yet-unenacted law. For the record, newspapers actually had a head start over Google. But Google “got” the web. And newspapers didn’t. That’s not Google’s fault. :: Several newspapers launched their first websites by the time Larry Page and Sergey Brin met at Stanford University in 1995 and started noodling on a research project called BackRub. :: Two or three years before the first public peek of the still-nascent Google in 1998, the ill-fated and short-lived New Century Network had a plan to aggregate the content from 140 newspapers in searchable format for the web. The plan, which included the idea of inserting ads in selected markets at the push of a button, died when NCN succumbed to industry infighting. :: It was not until October, 2000 – a good five years after most newspapers were up and running on the web – that Google figured out how to make money off its spectacularly growing traffic by selling keyword advertising. 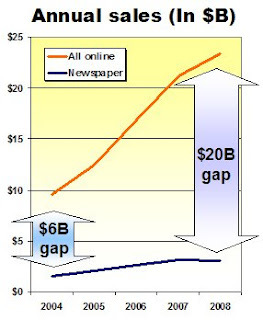 As Google and many other savvy online publishers learned how to capitalize on the openness and interactivity of the Internet, newspaper publishers stubbornly spent the last 1½ decades trying to sustain their once-enviable print business model in the face of overwhelming evidence that everything was changing: technology, consumer patterns and advertiser behavior. For an excellent example of the sort of opportunities missed by the industry, look no further than this tale of how the Boston Globe blew the chance in 1995 to buy a significant share of Monster.Com for a comparatively modest $1 million. Or, ask yourself why Dow Jones, the publisher of the Wall Street Journal, never started its own online stock site. Instead, Dow Jones waited until 2004 and spent $520 million to buy MarketWatch, faithfully printing stock listings in the newspaper all the while. Today, print advertising has fallen off a cliff because consumers find it faster, easier, more timely and more fun to get their news online. Advertisers increasingly are gravitating to online media instead of print, because it is cheaper, highly targetable and the results can be readily measured and analyzed. None of this is Google’s fault. Blaming Google won’t help. Alarmed by what they believe to be widespread piracy of their copyrighted material on the web, some publishers want to force companies like Google, Yahoo and Microsoft to stop serving ads at sites carrying unauthorized newspaper content. The movement to target the pocketbooks of content poachers emerged this week at a private meeting of top industry executives that coincided with the annual convention of the Newspaper Association of America in San Diego. 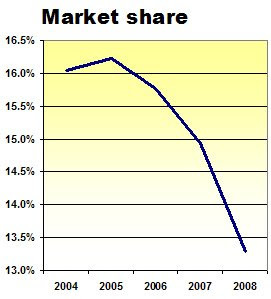 The private meeting, which originally was revealed here, was called to address the ways the newspaper industry might respond to the increasingly fierce online competition that has contributed to the 23% decline in advertising sales since the industry booked a record $49.4 billion in revenues in 2005. While many of the senior executives attending the meeting increasingly are focused on ways to charge for the expensively produced content most of them give away for free on their websites, another top concern galvanizing the participants is what they see as the unfettered use of copyright-protected newspaper stories on websites, blogs and other online venues. Fair use refers to the exception to the copyright law that permits someone to publish an excerpt of protected content in such cases as a quote in a news story or a video clip accompanying a movie review. 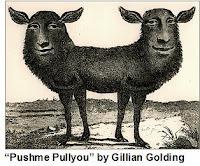 The problem with fair use is that publishers and fair users often differ on how much content is fair to use. What this means in practice is that allegations of fair-use violations can only be resolved in court on an after-the-fact, case-by-case basis – and only when a publisher is sufficiently aggrieved to devote the time and expense necessary to sue the party accused of publishing the disputed content. But publishers don’t want to expend their increasingly precious resources scouring the web for content poachers and then hauling them into court. Instead, a number of them want to begin adding a bit of computer code to every copyrighted story and telling such online ad services as Google, Yahoo, Microsoft and Value Click not to serve ads to any page containing a story carrying a copyright tag. After putting the ad services on notice, the publishers presumably would watch for infractions and, if necessary, challenge the deep-pocketed companies in court. Tagging technology already is used to track Associated Press stories to see where they go on the web. Evidence of the widespread misappropriation of AP stories is why publishers have become sufficiently alarmed to consider seeking similar protections for their own articles, images and videos. The other hot topic among newspaper publishers this week was whether and how to begin charging for at least some of the content on their websites. Participants in the private meeting, which was attended by an attorney to ensure the talks didn’t stray into inappropriate territory, said that publishers do not appear to be inclined to adopt a common, industry-wide protocol for charging for content. “There is a general feeling that newspapers cannot get together” on charging for content, said the participant, citing the group’s fear of being accused of engaging in anti-competitive conduct. A unique, invitation-only conference for senior leaders of technology and media companies will be convened at the Googleplex this the fall by the University of California at Berkeley. The UCBerkeley Media Technology Summit, which is being sponsored jointly by the Graduate School of Journalism and Haas School of Business, will be held from Sept. 29 to Oct. 1 at the Google campus in the heart of Silicon Valley. In addition to my teaching duties as a member of the adjunct faculty of the journalism school, I also have been organizing the conference with the guidance and support of Dean Neil Henry and Assistant Deans Gina Rieger and Paul Grabowicz. The conference is intended to provide the leaders of traditional media companies with new insights into the technologies, consumer behavior and advertising systems that will affect their businesses at a time of momentous change. At the same time, we aim to memorably underscore the value – and values – of journalism for the participants attending from the technology companies. Those values, of course, are objective inquiry, balanced reporting and effective storytelling. The intimate nature of the event, which will include a number of opportunities for participants to mingle socially, is designed to provide maximum networking opportunities for some 70 invited leaders from two industries who do not often have the opportunity to interact with one another. More details are here. To get further information about the conference in the future, please add your name to the mailing list here. The shocking banner headline today reporting the potential demise of the Boston Globe is greatly exaggerated. The story not only was vastly overplayed but also may serve to unnecessarily damage the newspaper’s already weakened business. The editors, who evidently let emotion overcome their news judgment, should have known better. 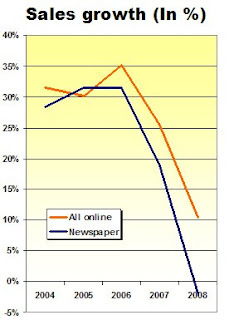 While it is unfortunate that the continuing deterioration of the newspaper business is forcing publishers to take previously unthinkable measures to reduce operating costs, it is not the least bit unusual in this toxic economy for the management at a newspaper – or an automaker or any of dozens of other businesses – to ask for concessions from its employees. 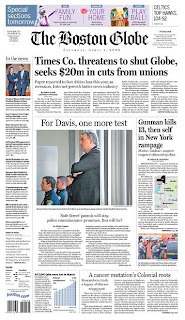 The only shock in the news from the Globe is that the New York Times Co. wants only $20 million in concessions from its unions to help offset an expected $85 million operating loss. Given the magnitude of the projected deficit for 2009, the target is surprisingly low. The givebacks were demanded at a meeting with union leaders on Thursday morning, where NYT Co. threatened to close the paper unless it the cuts are rapidly approved. Addressing more modest budget shortfalls at the Newark Star-Ledger and San Francisco Chronicle, the respective publishers of each paper extracted concessions of approximately $40 million and $50 million from their unions. Tough as this will be for employees whose pay, benefits or retirement are cut – not to mention those who lose their jobs altogether – the concessions being sought at the Globe appear to be relatively moderate as these things go. The Globe’s editors should have recognized this. They would have been well within their rights to publish a story about the management demands and the union response, but they went off the deep end in deciding to top today’s front page with a fat, two-line banner. Not only are they unnecessarily alarming readers and Globe employees but they also may have harmed the newspaper’s business prospects. The headline is almost sure to be used by salespeople for competing media to encourage merchants to diversify their advertising spend so they are not over-dependent on the Globe in the event the paper were to succumb. While few of us dare predict what will happen next in the ongoing drama of the newspaper industry, it seems highly unlikely that NYT Co. would walk away from its $1.1 billion investment in the Globe without trying a few more tricks to save the business. The Globe may stop spinning some day. But not yet. With furloughs becoming increasingly common in newsrooms, here are some thoughts on how to make the best of these potentially stressful situations. Clean the closets. Paint the bathroom. Trim the rose bushes. Do something completely different from your normal routine that will clear your head and make your muscles ache. Do this first. It is the most important. Now that you have your mind off your regular work, you can read the papers and watch the news like a normal person, not like a news person. If the project is painting the bathroom, you have to cover the fixtures with newspapers, patch the cracks, prime the walls and apply two finish coats. To get this done in a day or two means getting up early, working steadily and being physically tired at night. Notice how little time you have to skim the headlines, much less read the jump on sprawling newspaper stories? Now that you have a fresh perspective on the press, you can begin to understand how your audience feels. Start a blog. Make a video. Learn Flash. Figure out Twitter (if you do, clue me in). This is not so much to build your technical competence as to demonstrate that, yes, you can learn new things, overcome unanticipated challenges and adapt to the inevitable changes that lie ahead in the news business. Polish your resume. Line up some freelance pieces. Update your network. Having a properly packed parachute doesn’t mean you will use it. But you will feel better knowing it’s there. Scientific studies have shown that naps reduce burnout, which is defined as “irritation, frustration and poorer performance on a mental task.” Sound familiar? Although your normal routine probably doesn’t allow time for a mid-day siesta, it does now. Take advantage of the gift of time to recharge your batteries. But finish painting the bathroom first.